A component of the Family-to-Family (F2F) Program is our Care Individual Needs Guide (CareING). 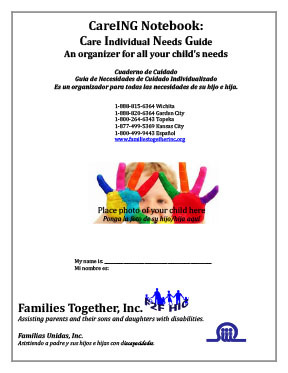 This is an organizational tool free to Kansas families upon request who have a child who has special health care needs. Parents can use the guide to keep track of important information about their child’s health care and educational needs. The CareING notebook is available in both English and Spanish and customized by our F2F staff to fit the unique needs of each child. For more information, contact one our Family Health Information Specialists.